The new racing yacht of the fashion house HUGO BOSS may not be the fastest sailing boat in the world, but one thing is certain: skippers and sailing fans around the world are not able to ignore this state-of-the-art yacht. 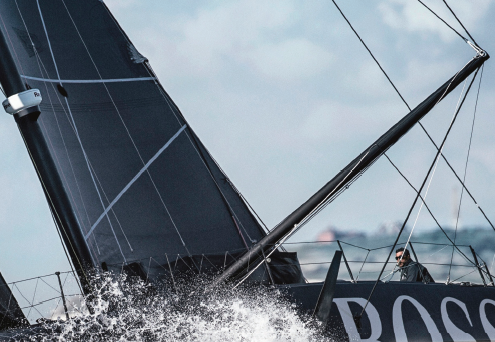 Alex Thomson Racing’s new IMOCA 60 racing yacht – also sponsored by the premium automobile brand Mercedes- Benz – is the first entirely black IMOCA 60 yacht in the world. This was made possible by painting the deck with a coating developed by BASF, which is based on the company’s functional pigments. The yacht, skippered by leading British sailor Alex Thomson, competed in its first Ocean Masters World Championship Race, The Transat Jacques Vabre, in October of last year. Yachts that feature black sails or a black hull are not altogether new. A deck structure that is entirely black, however, is a novelty because heavy sun exposure tends to heat up the dark surfaces enormously. This can lead to a heat build-up in the cabins below deck, which would make living conditions onboard extremely uncomfortable and can even affect the structural integrity of the composite materials. Hence, it was decided to use the functional pigments made by BASF to formulate the coating. They ensure that surfaces that are painted in dark colors can remain significantly cooler on hot days as they reflect rather than absorb heat. The ship builders used the special pigments that are sold under the Paliogen® brand, which are transparent for near infrared light (NIR), as well as functional NIR-reflecting pigments from the Sicopal® range. The pigments are an innovative solution for solar heat management: through their use, the dark surfaces of the deck reflect a large part of the sunlight that they are exposed to. The sunbeams penetrate the base coat while the filler below reflects the sunlight and ensures that the temperatures on the coated surfaces as well as inside the boat are significantly lower than they would be if conventional black pigments had been used. “The black coating of the deck has been made possible by the development of this coating technology based on functional pigments,” explains Arno Tuchbreiter, Head of Pigment Marketing for Industrial Coatings at BASF. The paint, based on functional pigments, is not only suitable for yachts and ships, but is also highly interesting to the automotive sector. “Mercedes-Benz has been involved in the development process at BASF from the very start, and we have conducted extensive testing of this paint on our vehicles. Our intention is to use it on various models over the next few years,” says Martin Bremer, Head of Color and Trim Mercedes-Benz Design. Because the vehicle interior heats up considerably less, there is a lower requirement for cooling by the air conditioning system. This will have a particularly positive effect on fuel consumption in countries with high average temperatures, at the same time reducing vehicles’ CO2 emissions. For more information, visit www.dispersions-pigments.basf.com.